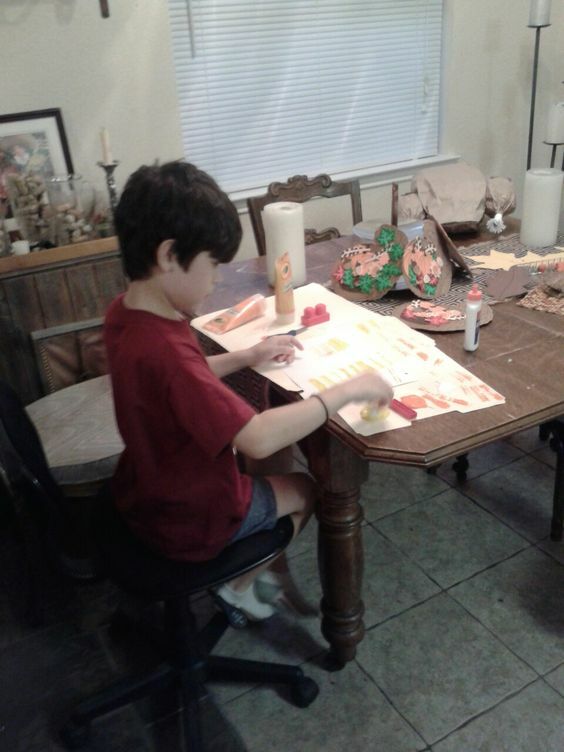 Wordless Wednesday, Create With Joy, Amanda's Books and More, Imaging, How We Roll Wordless. How exciting to have written your debut novel! 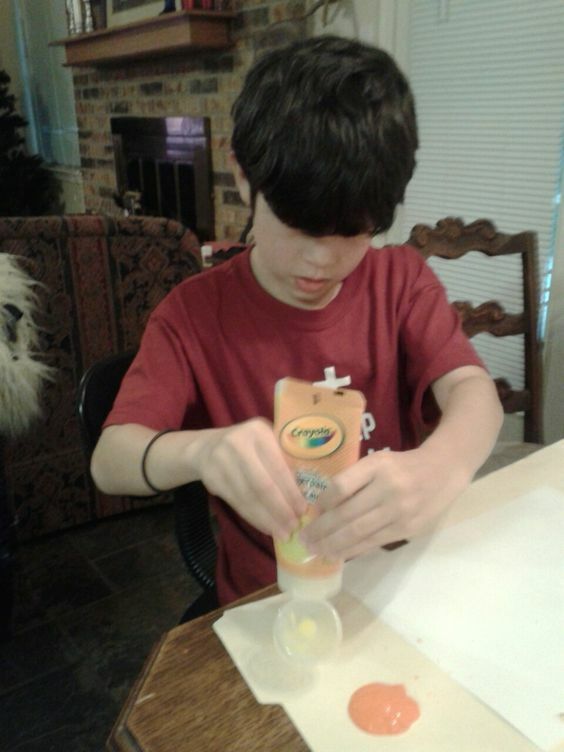 If you can tell us what was the most exciting part of actually seeing that finished product? Thank you Sherry! It is very exciting to have finished my first novel. Thank you also for previewing Dreaming Sophia and highlighting it on your blog. My novel, published at the end of August, took about two years to write. But if truth be told it has been thirty years in the making! It weaves together many strands of Italian culture in a mixture of fantasy, romance, art, and history. It is as diverse and complex as Italy herself. From start to finish readers are taken on a journey from the vineyards of Sonoma California to Florence, Fiesole, Lucca, Rome, Verona, and Venice. Along the way, they will discover more about Italy, popular legends and illuminating anecdotes, film, music, and food. They will also learn a bit of Italian to boot! The story begins with tragedy, with the main character, named after La Loren, being blindsided by fate. But, “Dreaming Sophia” is also a joyful story. It is a story about turning dreams into reality. So, in answer to your question as to what it felt like when I completed the story and finally held the printed book in my hands… I have to admit I was quite overwhelmed with joy. I also felt proud and satisfied. I realized I had finally captured on paper a story that I had been keeping inside me for a long time…one that in many ways explains my own journey to learn Italian and my fascination with the country. The month of March is a special time for me. I’ve heard that this March was very special for you. Can you tell us about it. Yes, March is a special month for me. Not only is it a month long celebration of my birthday (my birthday is the 28th!) but I will always remember it as the month in which I met Sophia Loren! It is my belief if you can envision something, you can make it happen. One of the themes Dreaming Sophia is the belief in positive thinking and making dreams comes true. Writing this book is an example of this. Not only did I take a pile of notes and blog posts and envision an end novel, but because of “Dreaming Sophia” I had the opportunity to meet Miss Loren after her one-woman show in Las Vegas last March. I was able to kiss her on both cheeks in the proper Italian fashion and tell her about my novel. What a thrill it was to see her smile at me and say to me: I believe in dreams, dreams become reality. Now, I’m curious about what makes March for you? Obviously you love Italy. Are there other places that you’ve traveled that could possibly be a good setting for a book? My love of traveling began at a very young age, fueled by my parents. My family hosted foreign exchanged students from Chile and Japan. As a family, we traveled to both those countries to visit the families of the students we had hosted. As a teenager I also lived in Hawaii for six months with my parents while my father, a college professor was on sabbatical. My senior year in college I traveled for the first time abroad to Italy all by myself. I choose Florence because of my love for Art History and Painting. At the time lived with an Italian family and traveled around il Bel Paese, visiting Siena, Rome and Venice and other small hill towns sprinkled around Tuscany. During holiday breaks I also went to France - Mont Saint Michel, Chartres, and Paris as well as a few cities in Germany and Austria. I have visited many places around the globe, and there are other places I’d like to go, but for now I seem to keep returning to Italy twice a year now, where I can use the language that I’ve worked so hard to learn. Italy itself is such a diverse country and every city and every region is unique and offers special and unusual things. For me, it is an adventure traveling to new places within Italy itself learning about new legends, customs, and practices. Italy continues to fire my imagination, and currently, I am working on a new novel concept that will take place in Arezzo, a charming town in southern Tuscany. I think the location of Italy is obvious but can you tell us how did the story line evolve? The decision to write a novel came to me gradually, fueled by my years of working on the Studentessa Matta website - a dual language blog I write in Italian and English. I wanted to try my hand at fiction and weave together many of the stories I write about on my blog. I was also inspired by several published women author friends. 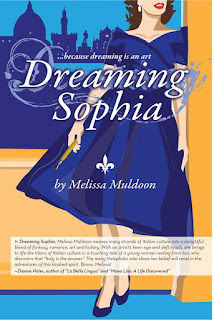 When I sat down to develop a fictional story, I tossed around several ideas, but as I glanced up at a picture of Eleonora de' Medici painted by the Renaissance artist Bronzino pinned to my idea board next to my computer, the original draft of Dreaming Sophia began to flow out of me. I was a little surprised at first by the direction the story took right from the beginning and was immediately captivated by the characters of Sophia and her mother. As I continued to write and began developing the conversations between Sophia her Italian muses—Eleonora de’ Medici and her encounters with Leonardo and Michelangelo and Prince Lorenzo I was thoroughly hooked. I wanted to continue exploring the theme of a young girl rising out of tragedy, learning how to cope with her grief who eventually finds the confidence to create a new life and artistic career for herself in Italy. I also wanted to tie in the many personalities from Italian art and history and have my character “meet” them through her daydreams. Although the story begins with tragedy, ultimately it ends joyfully. It is about falling in love with one’s self and finding inner confidence, as well as falling in love with a country and its culture. Your book is filled with fanciful characters. Is the book based on fantasy or on reality? "Dreaming Sophia" is based on a contemporary reality. But there are elements of fantasy and at times a blending of fact with fiction. An important aspect of the book was to explore the reality of living in Italy, its customs, language and current events. But, being somewhat of an imaginative daydreamer myself I also wanted to tell a story in which my character Sophia could talk to famous Italian personalities from past eras—the titans of Italian history and culture—through her creative thought processes. Originally I thought about calling the book “Sognare ad occhi aperti”. In Italian, this means to daydream. So even though there are fanciful sequences, Sophia’s dreams are very real to her. They are a way for her to process the information she has heard previously from her parents and her teachers. As she heals and grows stronger, she can accept the “advice” and the “gifts” each Muse gives to her, to move on with her life and make positive changes. Sophia’s journey is about turning her dreams into reality, but it is also about finding a balance between fantasy and reality. Sophia Loren the actress also knew the importance of finding this balance. She grew up in a time of war, famine and poverty to become a famous movie star. La Loren knew how to imagine and visualize a better life for herself. She knew that a fairy tale loses its magic without real life and that the opposite is also true. The most beautiful thing in life is to learn how to walk between the two. My character learns to walk this fine line between fantasy and fiction and does indeed move to Italy to pursue a career as an artist. It seems her dreams have come true. But once she arrives in Italy, she is faced with a new set of realities. Sophia must adapt to a new culture, a new language and life with an Italian family. She also must navigate the complexities of a new social network as she also starts to date, Italian men. More perplexing than that, she must learn how to survive the labyrinth that is Italian bureaucracy as well as succeed as an artist in a foreign country. In Italian, there is another idiom: Hai voluto la bicicletta, adesso pedala! You wanted the bike now learn to pedal! You wanted this, now learn to deal with it. And this is exactly what Sophia learns to do. I write in various places. I begin writing on my big desktop Mac in the privacy of my home office. I have two large monitors for my graphic design work so that I can have multiple windows open with all my notes and drafts. I am a prolific writer and every day I save my current draft to my iCloud. When I go to the gym, I re-read what I have written on my iPad and take additional notes while I’m on the treadmill. I also often find secluded corners of the house and sit with my lap top and write on that device as well. Every time I read the story on a different screen - big or small, or read it in a new setting I see it in a new way. I work best early in the morning and very late at night. But, I am always thinking about the story line throughout the day, when I’m shopping, listening to Italian music, or making dinner. Some of my best ideas come to me when I am relaxing or out for a walk with my two beagles. I am also prone to replaying the entire story in my head as I’m trying to fall sleep which often prompts me to get out of bed and fire up my computer and start writing in the middle of the night. I am a graphic designer and a very visual person, so it helps my creative process to illustrate my characters and have a vision board of all the places the story takes me. It is during the times that I am illustrating my characters additional ideas come to me. You can visit the Dreaming Sophia Pinterest Boards to see my character illustrations as well as all the lovely places in Italy that I write about. And one last question. Now that the book is finished are you taking a little vacation? I have just returned from Italy where I spent a month in Tuscany with my fall Arezzo Italian language immersion group. I am home again in San Francisco Bay Area and am now getting ready for the holidays and spending time with my family. I am staying put for a couple of months and will be busy posting new articles about Italy on the Studentessa Matta blog and Youtube channel. I am fortunate, because for me, writing about Italy is like taking a vacation there every day. You can also find me on a new website I have created a Dreaming Sophia. On the Dreaming Sophia website, Facebook Page and Pinterest Boards, I plan to post more stories about Italy and art history. Through the website, I offer items I have designed, such as Dreaming Sophia book bags, t-shirts, mugs, and calendars. As I said, writing about Italy is like taking a vacation for me and so I am also developing an idea for a new novel and plan to start writing soon! Stay tuned! 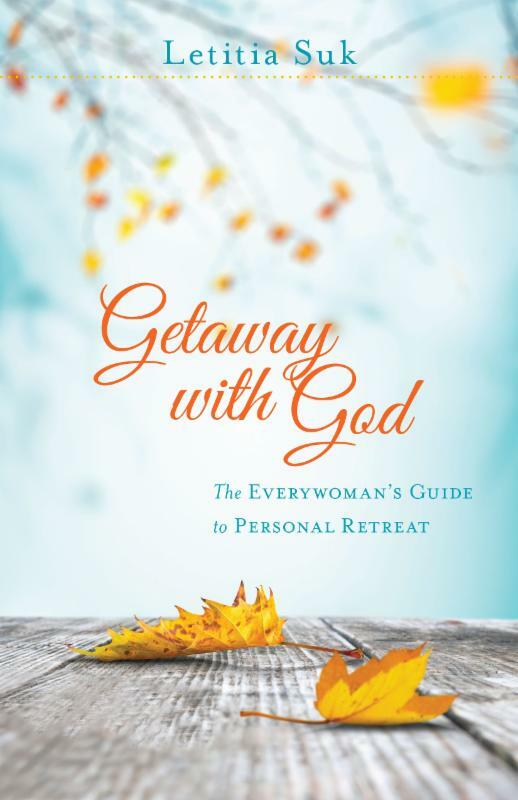 Thank you Sherry for featuring Dreaming Sophia on your blog “My Journey Back”. I have enjoyed my “journey” of bringing Dreaming Sophia to life. I hope you too will enjoy your travels with Sophia! Non smettere mai di sognare—never stop dreaming! Come over and link all your Christmas posts! Thank you B.J for making our sweet invite! Thinking about my day/week. The crock pot is started and I'm sitting 'my room' which is either a sewing room, or a crafting room. It depends on the day. Today and for awhile I am surrounded by Santa Claus. Maybe is should be called The Christmas Room. 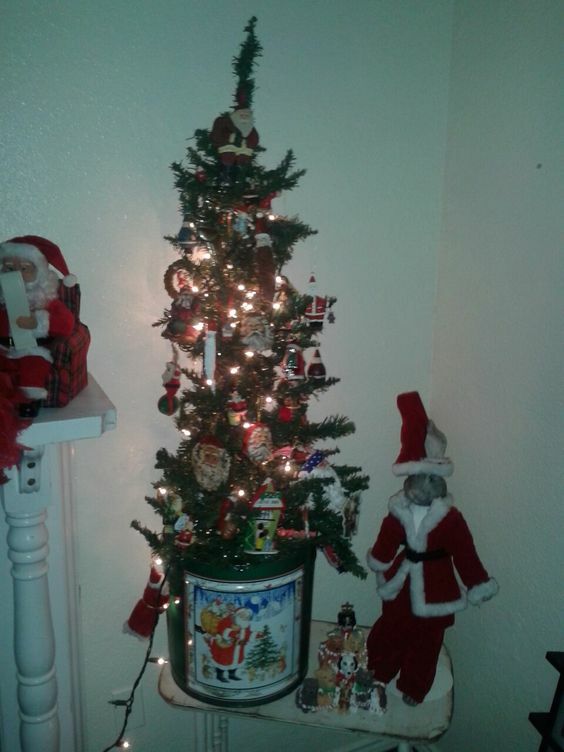 Christmas and all that I still have left to do before I begin my virtual tour on the 1st. Maybe I'll share a sneak peek here today. Hmm. I don't have one. I should change this prompt. The Litfuse blog tour begins tomorrow. I'll be reviewing on the 1st. Sunday's I love the Flipping Flea Market finds. All my laundry. I only do about 3 loads: Dark, White and red. Trying to finish up the decorating. 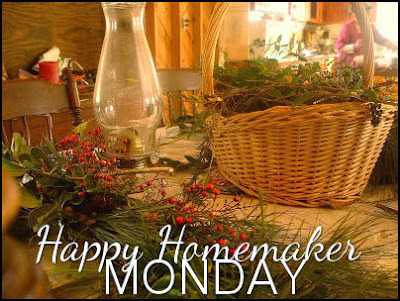 I'm so glad we started last Monday. It is taking forever. I think/I hope because it's a new house. Nothing at the moment. I need to get my daughter's Christmas present back out. I am working on a scripture journal. Spending time with my daughter. Not really camera ready but still fun. Speaking of fun . . .
Our Holiday Journey on the 1st. I'd love for you to come over and link all your Christmas posts. Old or new. Feel free to link your archived posts! This is from my yesterdays Simple Sunday post. 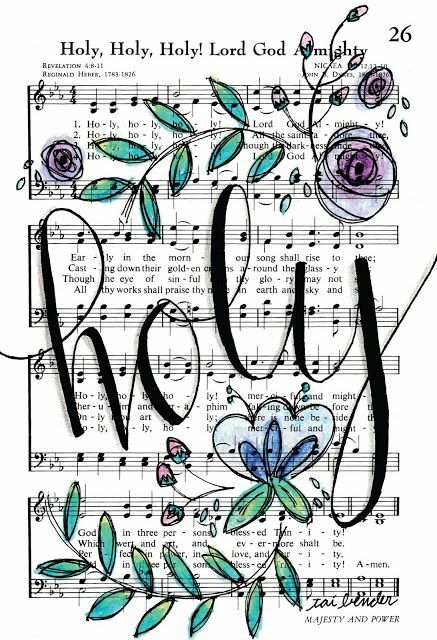 Every Sunday I share a printable or scripture art that I have found on pinterest. This lovely piece is available in an etsy shop. Click Here. 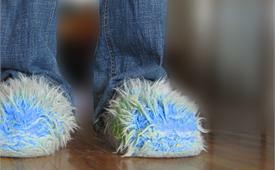 The blog is where I get some of my inspiration for the book I am making for my daughter. Thanks for beginning your week with me. Visit my parties page to visit my other favorite parties. is called to "Wake Up!" 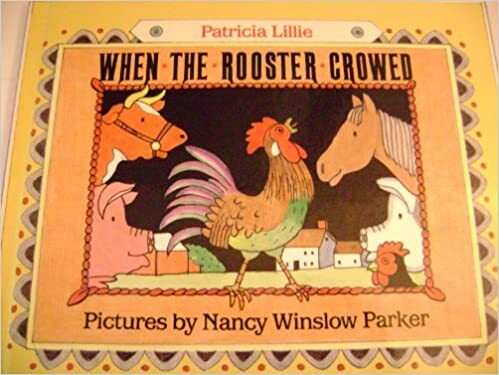 When The Rooster Crowed by Patricia Lillie is a wonderful children's book. Perfect for preschoolers! The book is beautifully illustrated by Nancy Winslow Parker the illustrations are fun yet each animal looks real. As each of the farmers animals wake up and restlessly ask for their breakfast the rooster crows. And Farmer Albert who must have had a hard, long and tiring week asks " 10 more minutes." Then each time counting down till he finally has to give up and feed the animals. The story beautifully tells about all the animals on the farm. individual sounds of each animal. And when the Farmers Wife calls him loudly down for breakfast! Although this fabulous book is out of print the illustrators website has a link to inquire for purchase. The book is available through amazon. Click here. There's plenty of time to find a copy for your special little one for Christmas! The review of this book is my opinion. I was not asked to review it by anyone. A Little This..A Little That. AnD What Do I Do Now? Today I thought I would share a few pics of our house. Now that the trees have been trimmed . . . I actually don't know which is worse. The before or after. 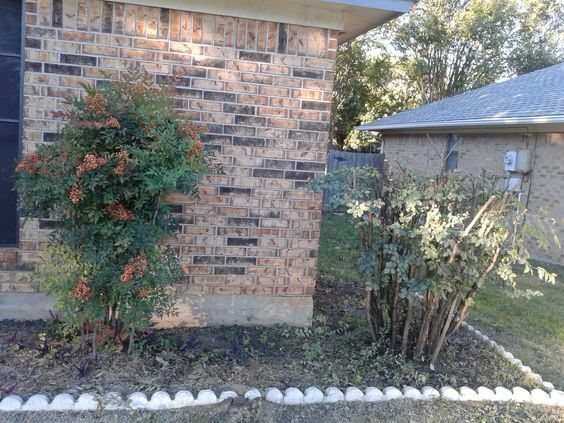 Now I don't know what to do with this space between the very overgrown nandina's that the landlord wouldn't trim. Said it was our job! I'm thinking of planting the ornamental grass that I have in a pot. Remember it . . . This is what the pots looked like at the apartment. They were by the front door and got the super hot afternoon sun. The apartment faced the west. 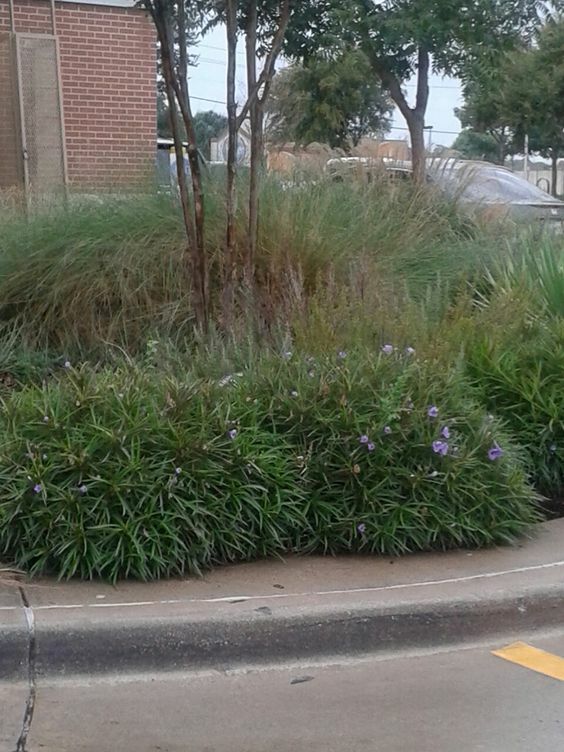 This is a similar grass at McDonalds there is one that I think is just like mine at a neighbors house. I think the grass might do better in the ground. So that is my task for tomorrow. One of the things I love about Texas is once we get past the summer our weather is gorgeous. It might be cool in the morning but the afternoons are always nice. 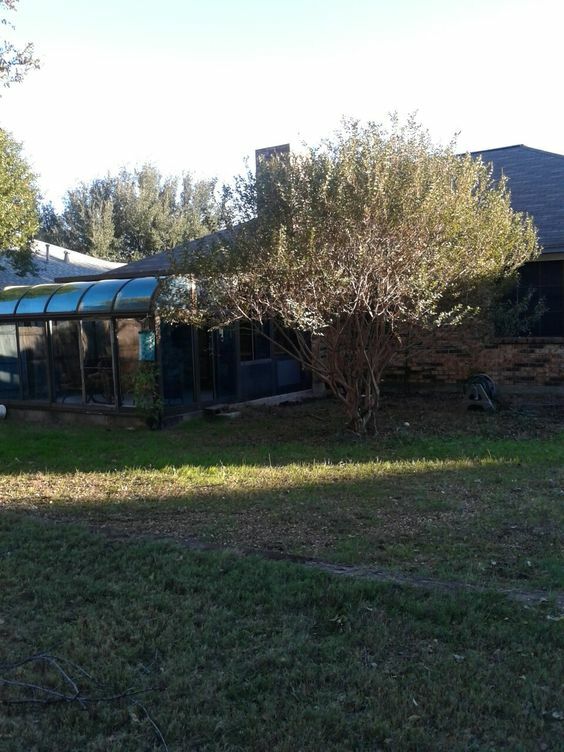 Here's a shot looking toward the nandina's you can barely see the house behind them. I was grateful the beds have decent edging. There were two chrysanthemums one was purple. 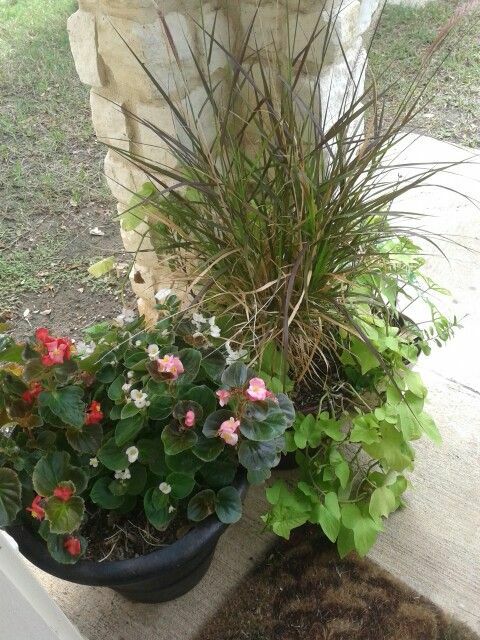 The other wasn't watered well so the blooms were dead. But the plant is green. 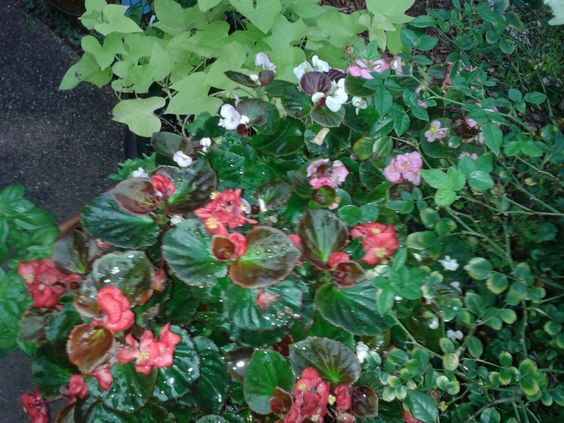 You can't see from this shot but there is one in the pot with the crazy begonias. I'll put it in the bed too. The caladiums will be dug out of the pot too and stored for winter. I don't think I have ever seen any this big. They are like a bush. They love it here! There were originally 6. All crammed in a hanging basket. I got them from my daughter and grandson for mothers day. I separated them about the end of June. This is what they look like now. This is one of the chrysanthemum's . . .
And some weeds. I'll be pulling them up when I replant the one I have in a pot. I'm hoping to get a few pansy's, dusty miller and lambs ear for this area. Here's a shot of the same bed from the front . . . This is where the 'What do I do now?' comes in. 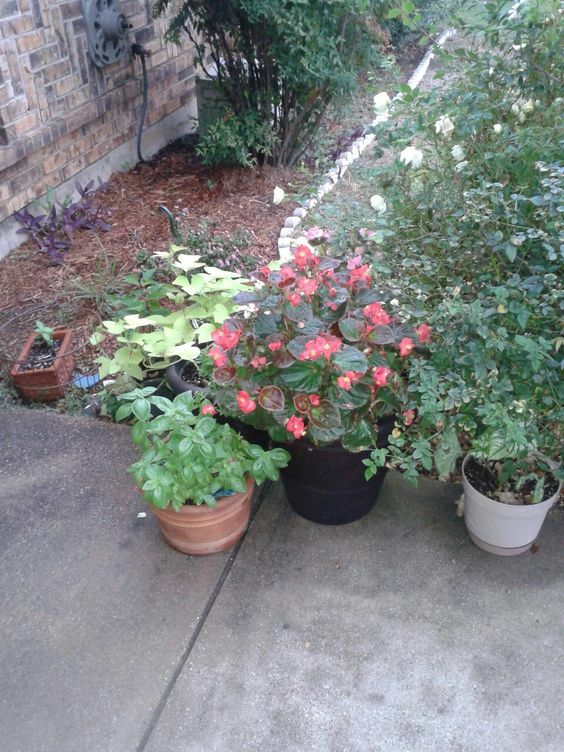 You can barely see that pot of caladiums. 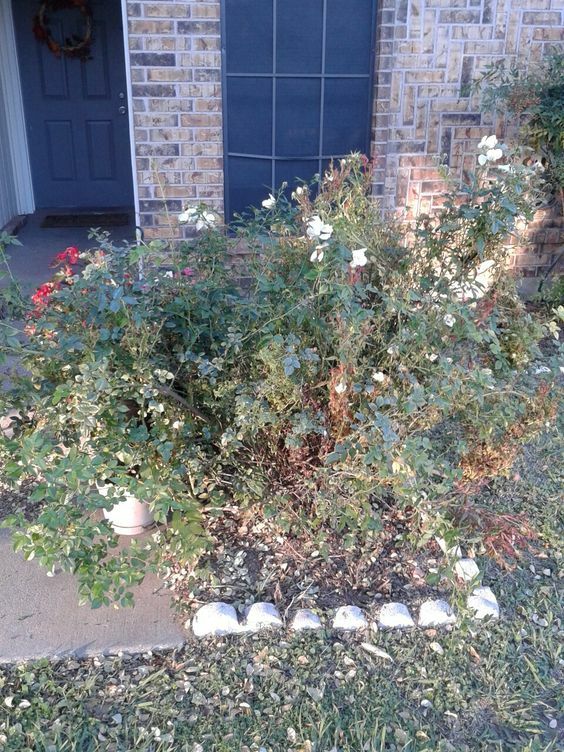 I have no idea what to do with this rose bush. I'm thinking they should have cut it waaay back almost to the ground. It's really tacky now. 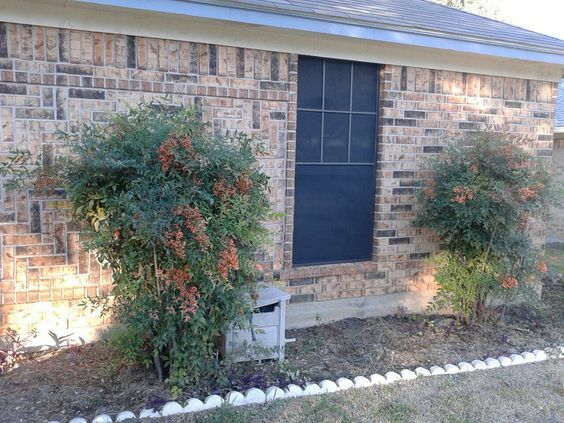 This is the other side of past the nandina's . . . I don't know if you can tell but this is a crepe myrtle. It was taller than the house. Just past it was completely covered in scrub brush and trees. 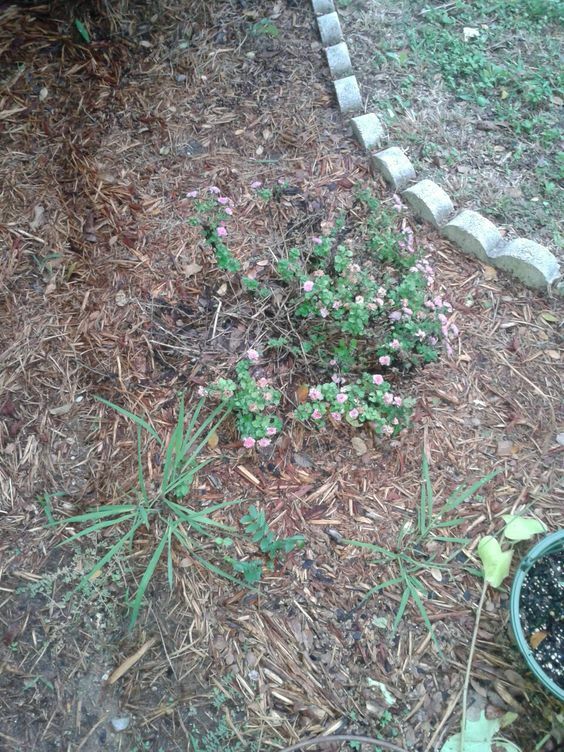 Actually the entire front bed was covered in the scrub trees. They were all 4 ft. high or more. I should have taken a picture of the pile of brush before they hauled it off! 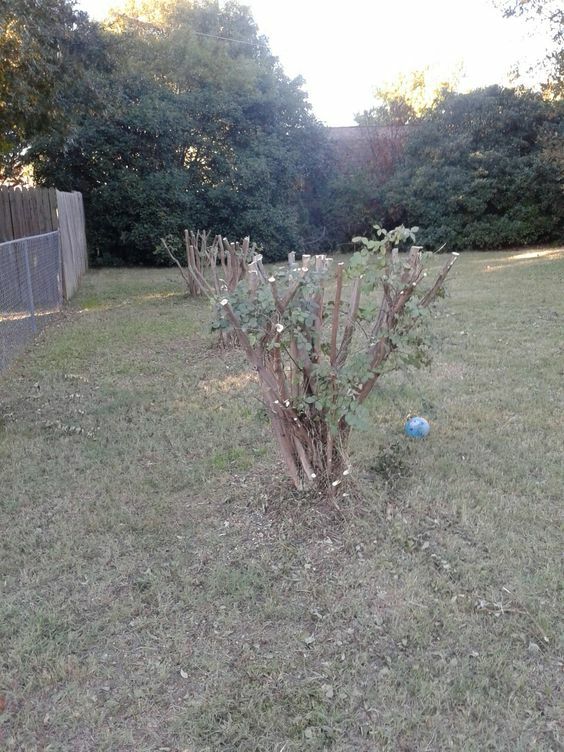 There are three crepe myrtle's in the back yard along the side fence. An old ball was uncovered from all the mess. And now a shot of probably my favorite part of the house . . . I love this room. It is so cozy. I sit inside almost every evening and read till it get's too chilly. I was sad that they didn't trim the huge overgrown crepe myrtle that is beside it. One bad thing I found out about the property. It might be hard to tell from this shot. But just past the foreground is a sunk railroad tie. Then there is pea gravel covering the ground all the way to the house. You can see how big the bush is. The area behind it was completely overgrown and covered in weeds and scrub. I planned for the area to be a vegetable garden. Sadly I found out from the neighbor that 3 years ago and for about 2 before that it was a fenced off area. A kennel for dogs. A lot of dogs. So I don't think I actually want to plant in the area. Which I guess is o.k. but now we'll have to do raised beds which will be more expensive. Not sure how many we'll be able to afford for the spring. Since we won't have a huge budget; I'm considering something like this . . . There is a great one over on my pinterest board but the pic is water marked so I didn't want to use it here. But if your interested here is the link. So I'm wishing and dreaming and doing some planning. And wondering what to do about that rose bush. What to do about that open spot between the bushes in the front. 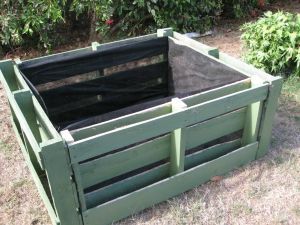 And how to get a vegetable garden in that back yard. Did you see my parties page? I've been trying to get it updated to list all the parties where I link. I'll be linking to some of my favorites. 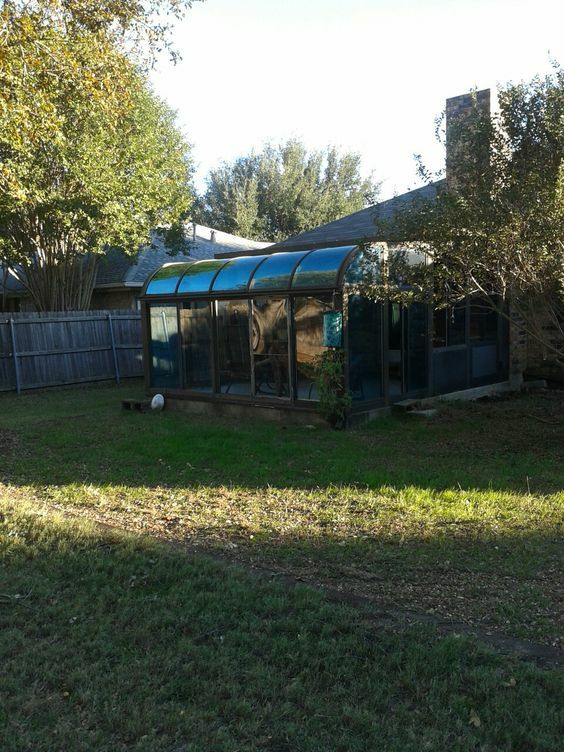 Leave me a comment and give me your suggestions for fixing up this yard! I'm tired thinking about it. I'll just put my feet up for now. "It is a good thing to give thanks unto the Lord, and to sing praises unto thy name, O Most High: To shew forth thy lovingkindness in the morning, and thy faithfulness every night, [...] For thou, Lord, hast made me glad through thy work: I will triumph in the works of thy hands" (Psalm 92:1-2,4). 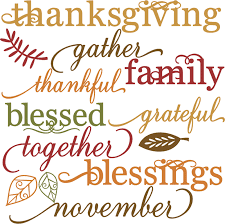 Wishing you a wonderful day filled with blessings and fun! Come over here and join the party! I haven’t had the pleasure of reading any of your work before so let’s start at the beginning. 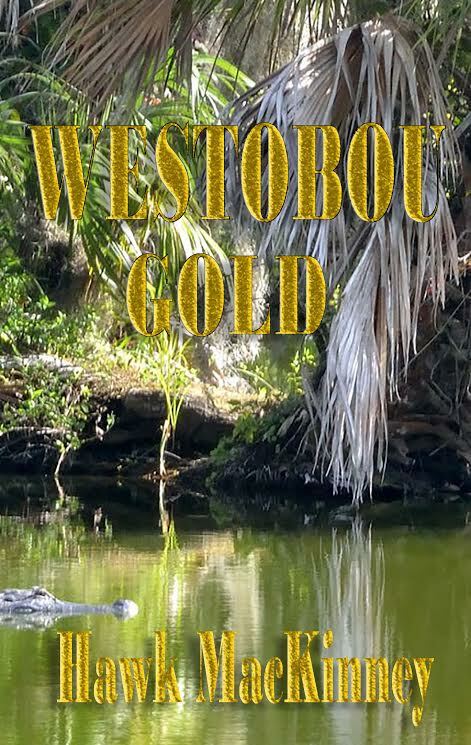 Can you tell us what kind of story Westobou Gold is about and what Genre? 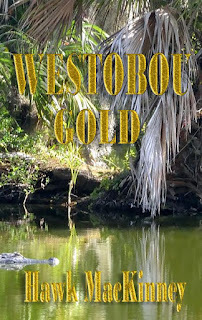 Westobou Gold is the second title in The Moccasin Hollow Mystery Series. This second book is a tale of greed complicated by out-of-control compulsions that become paranoia. My favorite characters in the series are the women with the swirl and dash they add to the historical backstory of the romance genre and the contemporary chase of mystery…the same covert intrigue that the serial character Craige Ingram brings from Book 1, Hidden Chamber of Death. Did the character of Craige Ingram come before the Moccasin Hollow Series? Yes…the distinct backgrounds of an unnamed figure of Welsh, French, and Scottish kith-and-kin laid out a wealth of character/personality traits long before placing the figure into outlines, themes, settings, plot, etc. to become The Moccasin Hollow Series. The serial aspect of the protagonist-character theme, the Ingramme/Ingram name went through several changes and backgrounds to become an uncompromising principled Southron with the will from his forefathers—and Grannie—to survive. Craige Howelle Graeme Roynane Ingram...with questionable branches of twined family trees and heraldic honors with Coats of Arms—I researched hundreds of single-spaced pages, ancient genealogy bloodlines…stirred and mixed the character that eventually would become Craige Ingram. Much of the shaping of the protagonist was nonfiction woven into deniable fiction…like most of our immigrant European, Welsh, Irish, Scottish ancestors. Did you develop the series to give Craige something to do? With such hot-blooded powerful ancestors, land barons and their industrial legitimate and illegitimate prodigy, PI Craige Ingram needs no prodding. He doesn’t lack for places to be, things to do, or people who need help and know he can be trusted. He picks his cases, and lucrative investments have given him the opportunity to be lazy when he wants to retreat/recharge at his ancestral home, Moccasin Hollow. As a SEAL, Ingram was tasked as the Commanding Officer to select the men to outfit an antiterrorist covert unit. He stays close to his serial-characters SEAL buddies across several states…lawyer, forensic doctor, sheriff, and police lieutenant. SEAL to the core, unit members retain their code of ethics in their civilian pursuits—considerate of others and of the consequences of their decisions. They can be animal-intense when the situation demands it. I see that our main character in Westobou Gold, Craige, is a retired Navy Seal. Is there a little bit of you in Craige’s character? Absolutely…probably more than at first intended…which is nothing new with writers of any genre. I am not a SEAL, but my military career positioned me in some of their support units. They live hard, fast, sometimes crude, but always there when needed…no matter the hangover. Writers pull from themselves and from the brew of life around them, then wrinkle non-fiction yarns into a fiction brew that isn’t fiction at all. Nor does most tales told fit snug and neat into any genre. There’s a bunch of romance with the serial characters in The Moccasin Hollow Series…especially in the historical romance, Moccasin Trace, which gives the historical background to the present-day mystery series. would be a part of the series, or is that developing as the series moves forward? A series wasn’t planned until character sketches were expanded. Character back-and-forth relationships expanded until red flags warned of too many twists, plots and subplot-plots were flying for Hidden Chamber of Death. There were rewrites, hard edits and storyline cuts…with Book 2, Westobou Gold in the offing. It hasn’t stopped. How many books? I’ve no idea, but certainly more than I’ll ever get put together. The story is interesting in that it has an underlying historical significance. Did you come up with the historical/legend of the story first? I’d like to claim that was planned/outlined from the start. It wasn’t. The legend fed the story, a tale waiting to be jig-sawed with murder, greed and gory madness. From all manner of researched notes Ingram and Graeme and Greer and DeWorthe characters/plots warped-and-woofed into Moccasin Trace, the historical romance of the Ingram bloodlines. The scenes/settings and characters’ backstories of Moccasin Trace were trimmed to a draft of the first and last chapters in both Books 1 and 2, Hidden Chamber of Death and Westobou Gold in the mystery series. Through the generations, family names changed from Craige Howelle Graeme Roynane Ingramme to Craige Ingram—a whole basket of learning and a lot of fun to weave the characters through each title. Book 3 is with the editors…and away we go. How did you choose the location of Westobou Gold? Why Westobou Gold? The legend, locations, landmarks and settings came near readymade. Some characters blended with other caricature-cutouts or moved from other sites; unrelated but juxtaposed in the tale being spun. Timespans were crunched or expanded; the pieces waiting for Craige Ingram and his significant ‘others’ to have the webs spun around them. The decades of writing through my teens were west of the Mississippi except for cousins and creek-cousins in the Cajun lands south of New Orleans. Making a home east of the Ojibwas’ Big Muddy Mississippi River in the Southron heartland was a land steeped with histories and sites and whispered tales and “…gran’mas what dun knew ever’thang from the livin’ of it”…most ’specially family histories. It certainly wasn’t part of my homegrown horse and dogs and gone huntin-shootin’ southwest upbringing. One of my college majors was history. Heaps of Southron lore was waiting. Baiting me like a bass on a hook. A whole world of histories, and my wandering roots dun took deep-hold. I luv it! have to do any special research to develop the story or plot in Westobou Gold? With all the gran’mothers that know their history cold—that’s a most explicit and definite YES. One of the dictates of the research, it is imperative to keep historical events/places and characters historically correct in a work of fiction like Moccasin Trace. One glitch—something inaccurate—and it’s a solid platinum promise, more than a few razor memories will spot it. Senior moments blown to blazes…some of the Southron octogenarians are sharp. It is critical to fact-check and research from more than one or two sources. Internet browsers are a great tool, but reference librarians are way-beyond-awesome in digging up often-archived details. When you’re not writing do you have a hobby that keeps you busy? My hobbies are varied. The well-worn comment, “Reading a well-written book.” More to the point, a nonfiction well-written history by a writer that was contemporary to that history; i.e. the unabridged The Decline and Fall of the Roman Empire. It was a slugfest and in many places a real drag, BUT it had some hidden treasures in it as well. Another hobby—collecting original contemporary Southron watercolorists to place them in museum collections for everyone to enjoy instead of secluding the pieces in some underground Hidden Chamber vault. Thank you so much for spending some time with us! our Thanksgiving table . . .
yellow, orange and white paint. 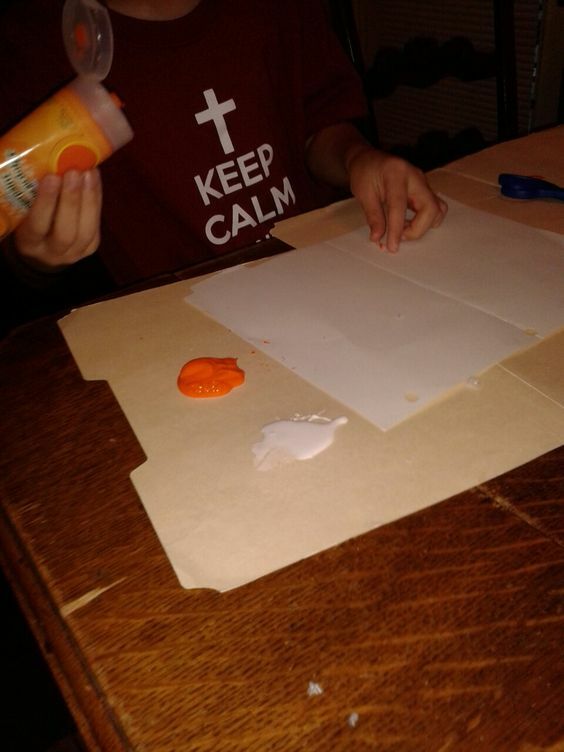 Then we dipped legos and duplos into the paint and stamped a file folder. This process was done in between Disney t.v. shows. But we had to let the paint dry. The paper bag turkey my DIL made last year. 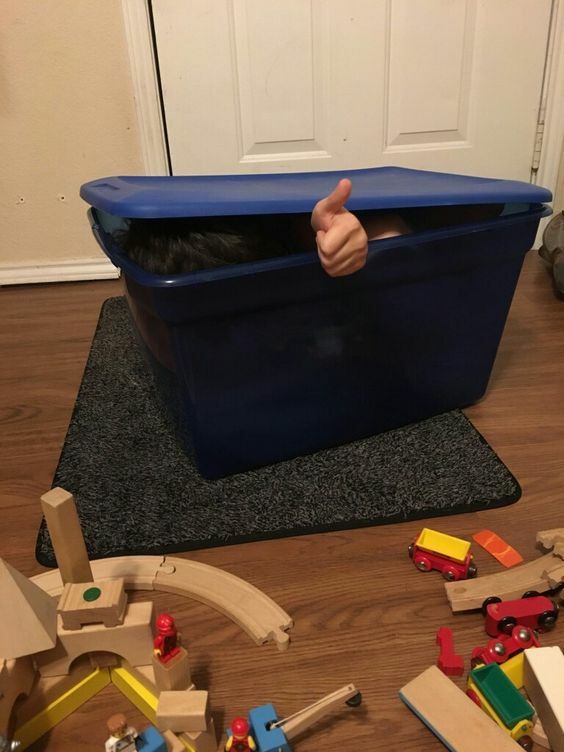 A few weeks ago my grandson made the foam kit cornucopia's. 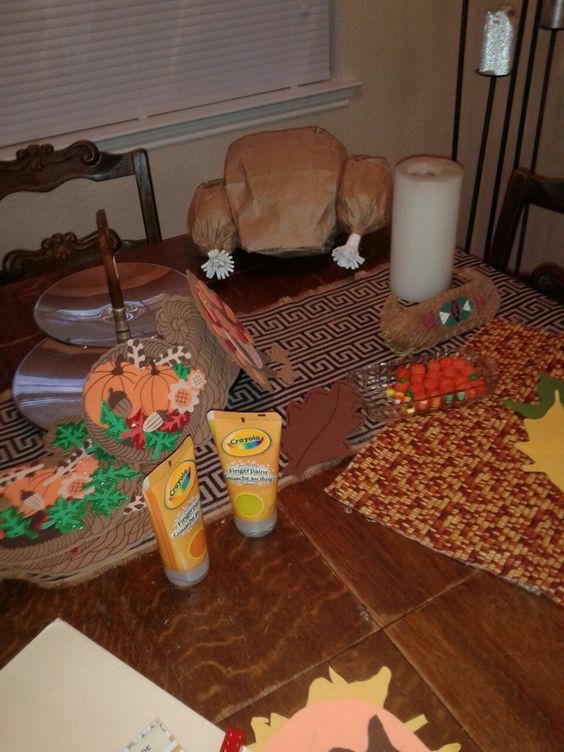 Our fun kid friendly Thanksgiving table is coming together. Linking at The Fabulous Fall Party. And my regular party places. Visit my parties page for links. 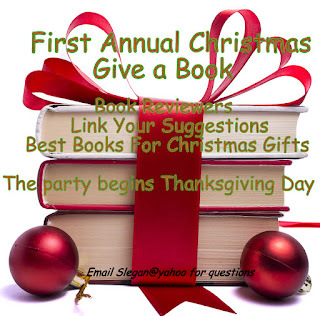 I'd would love for you to visit me Thanksgiving Day or over the weekend for the 1st annual book reviewers Christmas Present suggestions. The party is over here. Come and get some ideas or link your suggestions!